Martha’s Vineyard: Martha’s Vineyard is one of New England’s “it” spots during the summer, but it’s also a great location for a quiet winter trip. Besides getting served by a bartender who actually had a role in "Jaws," The Wharf Pub & Restaurant is a great cozy place to get some local seafood. While you walk on the main street you can take in the beautiful architecture or stop by the stores that remain open in the colder months. If what has been stopping you from visiting the Vineyard has been the pricing, winter might be the time for you. Harbor View Hotel, Edgartown: Luxury, ocean views, and Vineyard décor are just some of the things we can associate with the Harbor View Hotel. The off-season is a great time to enjoy the Vineyard because of the lower prices, the great hiking available and the emptier streets. Have some of the lobster tacos while looking out at the Edgartown lighthouse. Or if you’re craving a creative cocktail, try the Painted House Margarita. With 125 years under its belt, you are sure to have a wonderful time at the Harbor View Hotel. The Newes From America, Edgartown: For a quaint and cozy pub, check out The Newes From America. Located under one of the oldest buildings in the Vineyard, Kelley House Hotel, this pub is rich in history and character. We recommend you order the Rack of New England Draft Beers - you’ll even get a wooden nickel as a souvenir. Be sure to look over the menu, which includes a mix of American and British pub food, along with local favorites. It will be hard to leave this homey pub. Provincetown: Like many other places we’ve mentioned, this popular summer spot is a great place to go to escape the busy and crowded life in the city. You can walk along the beach for great ocean views or even take on the dunes. The restaurants are open year round and the bars have a variety of unique vodkas. Have a one-of-a-kind experience and visit the dozens of art galleries that line Commercial Street. When you’re ready to call it a day, head back to your room at the lovely 8 Dyer, a lovely and central hotel. 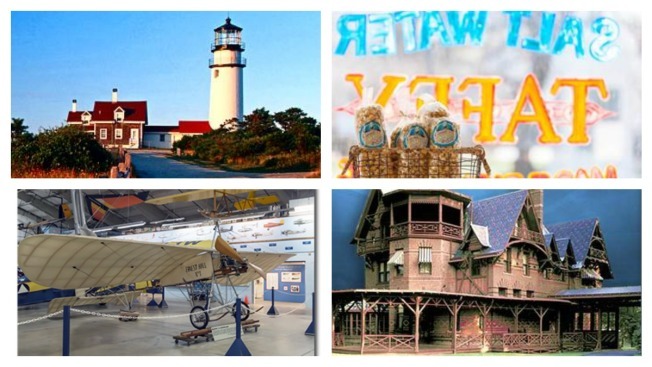 Highland Lighthouse, North Truro; Cabot’s Candy Factory & The Shell Shop, Provincetown: Visit the Highland Lighthouse grounds and learn about the lighthouse’s move in 1996 while taking in beautiful views. No trip to Provincetown is complete without a visit to Cabot’s Candy Factory for some homemade taffy, brittle, fudge, fruit chews and popcorn. After you’ve had your sugar fill, head toward the back to find The Shell Shop. It’s the perfect location for picking up an unique souvenir. Red Lion Inn, Stockbridge: The Red Lion Inn has been in business since before 1800, making it a historic site. No two rooms are the same, and the different options will suit whatever your needs might be. A pool and hot tub await you outside, while traditional New England meals are waiting for you at the restaurant. To top off a great day, stop by the Lion’s Den Pub for some live entertainment any day of the week. Norman Rockwell Museum, Stockbridge: Why not follow your stay at the Red Lion Inn with the museum dedicated to a man who immortalized that location on a painting? The Norman Rockwell Museum holds the world’s largest collection of original Rockwell art. Take a tour with one of the well informed guides for the full story on this classic American artist. Massachusetts Museum of Contemporary Art, North Adams: We have one of the world’s largest art centers right here in Massachusetts. MassMOCA hosts hundreds of visual and performing art pieces. It’s large and factory-style look can welcome large scale exhibits, unlike some smaller galleries. It’s a must see when it comes to unique art. Lee Outlets, Lee: Ready to shop ‘til you drop? With up to a 75 percent discount? Head out to Lee Outlets for a successful day of shopping. Cranwell Spa and Golf Resort & Alta Restaurant, Lenox: If you were famous during the Gilded Age and visited Massachusetts, there’s a good chance you stayed at the Cranwell Spa and Golf Resort. A resort full of history and glamour, it is the place to stay for an extravagant getaway. When you're done there, head on over to Alta Restaurant. This charming restaurant offers an elegant and healthy dinner. To accompany dinner you might want to select one of the 24 wines from around the world. Make your reservation early because it fills up quick. Fascia Chocolates, Waterbury: For all of the chocolate lovers out there, add this place to your must-see list. This family owned business makes all its products in house and in small batches, so you know they’re perfectly delicious and fresh. Go on the Chocolate Experience and Tour or be ready to get a little messy with the Make Your Own Chocolate Bar. And if you’ve been looking for that perfect Valentine’s Day activity for your loved one, how about a Special Valentine’s Day Dessert Night? New England Air Museum, Windsor Locks: If air travel is your passion, you might enjoy a visit to the New England Air Museum, appropriately located near Bradley International Airport. Adults will love the history and variety they will find inside. And the kids will jump for joy at the opportunity to climb aboard the aircrafts and play pilot. There is something for everyone - from just admiring to building to actually experiencing the crafts. It is an affordable experience for the whole family. Connecticut Science Center & Wadsworth Atheneum Museum of Art, Hartford: Are you or your kids science nerds? If so, you might want to check out the Connecticut Science Center. The dinosaurs, electricity and building station exhibits will keep them busy for hours. The Wadsworth Atheneum Museum of Art, the oldest continuously-operating public art museum, is a great attraction for artists or art enthusiasts. With everything within walking distance, you can easily enjoy some entertainment followed by some dinner. City Steam Brewery & Bushnell Park, Hartford: Located inside a historic building with nine levels of seating available, you might want to stay a while at City Steam Brewery. Order from a great selection of food items and cleverly named handcrafted beers. If you need some laughs to accompany those brews, stop in to the Brew-Ha-Ha, an in-house comedy club. Outdoors at Bushnell Park you can borrow and skate for free! Or ride a vintage carousel for only a dollar. These are definitely sites you can’t miss. Mark Twain House & Harriet Beecher Stowe House, Hartford: This 25-room Mark Twain House and its Victoria Gothic architecture was the perfect place for inspiration for Mark Twain’s writing. Take a tour and see all of the original items used by the family when they lived there. And surprisingly enough, the Clemens’ (aka the Twains') celebrity neighbor was also an author, Harriet Beecher Stowe. Spend a quality literature-focused day visiting the homes of these classic and revolutionary authors.